We’ve written previously about Turkey’s passionate love affair with liver, one that can turn downright obsessive in some parts of the country. Edirne, an old Ottoman capital city about two hours out of Istanbul, is one of those places. Filled with restaurants selling the dish and nothing but, Edirne is perhaps ground zero for Turkish liver lovers. If the city’s countless liver restaurateurs had their way, Edirne’s official symbol would probably be the organ, with a giant, quivering liver sculpture greeting hungry travelers at the entrance to town. Of course, that kind of boosterism is unnecessary; for many Turks, the name Edirne is simply synonymous with liver. 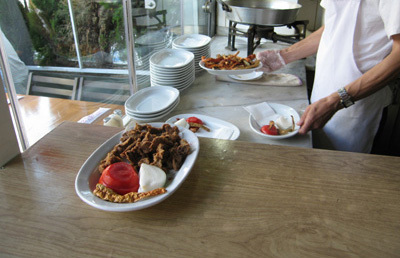 We visited Edirne several years ago and had what was a very fine plate of liver done in the local style. Although we’re not liver-mad enough to make the drive to Edirne just to eat the stuff (as some Istanbulites do), we were very happy to discover a few months ago Can Ciğer, a small spot in the Besiktaş neighborhood that is one of the few places in Istanbul serving up Edirne-style liver. Canım Ciğerim: Liver, My Dear? Advice: Dining with Kids in Istanbul?